While Archive Diving today, making sure my master image files were all good to go, I came across an image that I had forgotten about, from a crazy adventure trip to the Bisti Badlands in New Mexico. The Bisti Badlands, located an hour South of Farmington, NM. In May of 2013, a photographer friend and I decided to check out the Bisti Badlands for ourselves after hearing much talk about the unique landscape. The day we arrived, we set up camp and did a little scouting before we crashed for the night. We wanted to get up early enough to catch sunrise and be able to take in as much as we could since we had only allocated three days to explore and photograph. When the alarm went off, we got up and enjoyed trekking around; sunrise was okay, but I will say that the blue hour just walking around Bisti Badlands and taking in all of the stellar and amazing landscape. About 5:30pm, we looked to the West and saw one of those pesky Haboob’s and it was heading our way…fast! We did have to head west to get to our sunset location, but this made is both consider our options. Option 1 was to find a safe place to ride out the haboob and hope it did not last too long. Option 2 was beat feet back to the camper back at the parking area (about 2.5 miles away). During the 5 to 10 minutes we discussed our options and looked at my handheld GPS to see what it calculated as time it would take to get back…the haboob had made up our minds for us. We had to find a place to hunker down where we could be safe, but also have a good view of the area as well. Once we found a good place to hunker down, we set our packs down and then made three arrows using small rocks that pointed towards the parking area (a safety measureI felt was necessary). From 5pm until almost 5pm, the haboob hammered the Bisti Badlands. I’ve experienced some wild weather in my days, but that was truly an experience I’d like to forget! I can say that I’m forever grateful that my sunglasses were meant for alpine climbing / hiking, so the side shields prevented quite a bit of the desert sand from sand-blasting my eyes. I put my skull cap on in an attempt to keep as much of the sand out of my hair as I could (though I would later realize that the skull cap did little to really keep the sand away (lol). After the haboob passed, we started working our way to the sunset location (Cracked Eggs area). We were not out of the woods yet though. Sunset was still 20 minutes away, so this shot was the best I could create before we both felt it was wise to pack up and beat feet back to the camper at the parking area. Once we arrived at the camper, we were happy to see the first haboob had not affected the camper. We get some dinner cooking along with some coffee, then we each took turns using up some water with a nice, hot shower. My photography friend made sure the camper was secure and not going to go anywhere unless Toto’s tornado scooped us up (lol). We had parked the camper such that it was in-line with the wind direction, so that one of us would get the queen size bed on the windy side and the other would get the queen size bed on the non-windy end. While he was showering, the wind began to pick up and then the sand. The second haboob lasted about three hours perhaps four. By the time sunrise came the next morning, we both felt this trip was going to be cut short as the weather was just not cooperating. We hiked around the badlands for about three hours, then retuned to the camper, closed things up and set out on our trip back to Denver. Sadly, I have not yet returned to Bisti as the few times I have planned a trip there, the weather forecasts have been less than desirable! If you choose to visit Bisti Badlands, there are couple things I would highly recommend. 1) Make sure you have plenty of water (double what you think you will need, just in case). 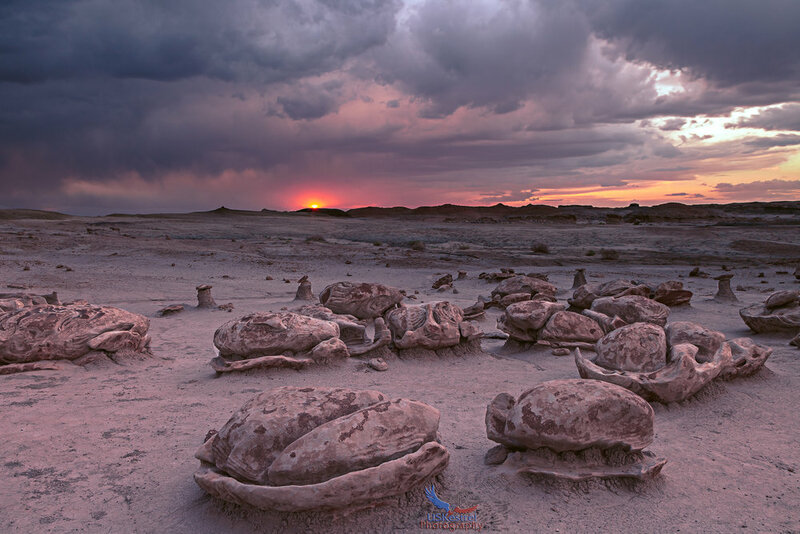 2) Check, double-check and triple-check the weather for Bisti and from Phoenix, AZ, Las Vegas, NV and Ely, NV for the time period slightly before you plan to be at Bisti Badlands and through the time you plan to be there. Watch satellite loops to be sure the winds and other weather components are not going to hamper your trip.